NW-bound posted photos of a cool turf-roofed house on the Myers-Briggs thread a couple of days ago. 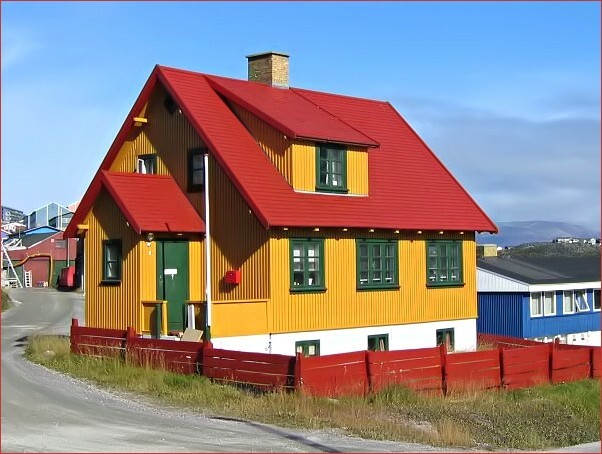 Helped by a hint from Tesaje, I found pictures of those and other similar houses online. It turns out they are at an open-air folk museum in Skogar, Iceland. I liked that picture so much, I decided to post a link to my all-time favorite house photo, which almost makes me expect to see Gaffer Gamgee digging his taties in the back garden. Sorry, but I can't figure out how to make the photo itself appear on this page. There's more information about how the house was built than last time I visited the site. It only cost about £3000 to build. I think it's amazing what a lot of skill can do with only a little money. I can't find the picture I want - am thinking of a large, airy ultra-modern in what looks more like a park than a yard. But I love hobbit-style homes, too, including the pictures you've shared, kyounge1956. Suspect it's the anthropologist in me....fascinated by the dwellings that other people and cultures create. I'm fond of our home, because it reflects the people who live in it. Although it looks like every other "brick-front colonial" on the East Coast, the interior is full of eclectic stuff we have collected, while our 3.5-acre yard is full of trees and shrubs that we planted ourselves, tend and defend, and almost know personally. We would have preferred a modern-style home, but local builders wouldn't touch them during the 1990's and we never had architect money. Personally, I have little appreciation for modern architecture. I personally tend to prefer houses that are symmetrical and unadorned (though some styles I like feature some pleasing asymmetry). My favorite houses to look at, are not generally ones in which I would want to live. As an extreme example, Neuschwanstein castle (see below). Breathtaking! Wow! Incredible! I think this is one of the most outstandingly beautiful structures in existence on earth. But for me? Not so good. Too many stairs, location too remote, more room than I need (or want to clean), I want a garage, and imagine the maintenance headaches. Here are some other cool houses. Below are some that I have photographed here in New Orleans, but still I would not live in any of them. The first house still had plywood up from Hurricane Gustav (I guess?) in 2008, when this photo was taken. The second house, with the tower, is where Napoleon stayed for some time so that adds to its charm for me. The third house is just a random pretty house in the Uptown neighborhood of New Orleans. I am still looking for my photos of my favorite house in New Orleans - - one that has won my heart and which we drive by frequently for that reason. Ah! Here it is - - my favorite house. The photo is not the best (click the image for a larger version. That helps.). The house has such mystery and grace, that does not come through in this photograph. I love the arches and so much about it. It is uninhabited and in ruins, and a large window on the left side has been covered with a black plastic tarp for at least 7 years that I know of. The cars in the driveway are all junked cars that I guess are there to make it look inhabited. My dream is that someone else (not me! ) will someday buy and restore this beautiful home. It would not be practical for me to live in such a house, sadly. The gray house is the one my mother's family rented 1/2 of, when they first emigrated from Dublin to northern NJ around 1930. They paid $25 a month (according to the census). The 2 houses with wrap-around fronts are typical architecture in Morristown, NJ. I haven't seen these kinds of facades outside of NJ. The maroon house is a little number in Spring Lake, NJ. What fascinated me about this house was the color-coordinated landscaping (which extends around all 4 sides). I like just about anything that's small and remote. Here is an old estate home just outside of New Orleans that we admire. We would probably rent half of the downstairs and have more than sufficent space. The next one is the last estate that we owned before downsizing. glippy, I like that one too. Where is it? Yeah, I would take that in a heart beat. Where's the nearest med store? It's quite a shock to be driving a small country highway out in the middle of nowhere, come around a sweeping curve and see this! This would be my dream house . Maybe not as modern but definitely on a beach . I found many different styles of houses interesting, but the one I would call my dream home is a circular one, particularly one designed by a company called Deltec. It is a modular design that comes in different diameters, and you can stack 1, 2, or 3 levels. Some owners use the bottom level for a garage. The appeal to me is the walk-around balcony and the 360-deg view. Of course, it would cost a lot of money to get a piece of land with such a water view in the Puget Sound, leave alone the cost of erecting a house like the photo below. Yep, that would work just fine for me too. I have more modest 4-6 container plans sketched out on graph paper of imaginary houses I'd love to build someday, heh. And that would be in N'Walins?